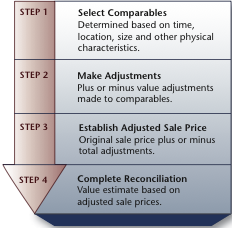 Direct Comparison is a standard method of estimating property value in which the subject property is compared with similar properties in geographically equal locations that have recently sold. Dollar adjustments are also made to account for all significant differences between property features, thus assimilating each property’s values to the subject one. Once these differences are accounted for, we can arrive at a meaningful estimate. TheDirect Comparison method is the most common method of evaluating real estate, being both easy to comprehend for buyers, and legally admissible in the Courts. This widely used technique is founded on the maxim that an informed buyer’s willingness to pay will not exceed the sale price of similar properties with equal utility. Since the conclusion is only as good as the data; several sources must be drawn into the analysis, which may include brokerage files, land title office records, mortgage brokers, and sales records obtained from the Real Estate Board’s Multiple Listing Service®, as well as other industry publications. The Direct Comparison method is most accurate when two conditions are met. First, a property market must be active enough to furnish reliable and verifiable data. Secondly, similar properties must exist within the subject property’s own region to create a genuine comparison. When these two conditions are not met, other methods may also be employed to create a valid estimate. Next week, we’ll look at the Cost Approach method of evaluating commercial real estate.